Mary Catherine Halpin, 89, died Wednesday, September 19, 2018 at the Christian Health Care Center in Wyckoff. Born in Philadelphia, Pennsylvania she lived in New York City , North Arlington for 32 years , and Wyckoff since 2013. She worked at the Bank of America in New York City retiring 24 years ago. Earlier, she worked at the Franciscan Friary also in New York City. She was a member of the Rosary Society of Queen of Peace Church, North Arlington. 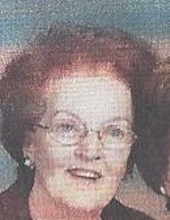 She was the beloved daughter of the late Thomas F. and Elizabeth ( nee Conlon ) Halpin , and the cherished sister of the late Elizabeth C. Halpin and the late Thomas F. Halpin Jr. Mary is survived by her loving cousins and friends. Relatives and friends are invited to attend the visitation at the Parow Funeral Home 185 Ridge Rd., North Arlington on Saturday, September 22nd from 8:15 a.m. to 9:15 a.m. thence to Queen of Peace Church, North Arlington for the Funeral Mass at 9:45 a.m. Interment will follow at Holy Cross Cemetery, North Arlington. To send flowers or a remembrance gift to the family of Mary Catherine Halpin, please visit our Tribute Store. "Email Address" would like to share the life celebration of Mary Catherine Halpin. Click on the "link" to go to share a favorite memory or leave a condolence message for the family.